I was rather surprised to find this extremely important work of dance history was not in the Library of Congress "American Memory" collection, and I could find no other copy online. However, thanks to the late Desmond Strobel, I have a copy he had made of an original in his possession, and I have now posted it here for the general use of the dance community. Thank you once again Professor Desmond. This is the first dance manual in the English language which documents the Waltz as it was danced at the time of its arrival in England, in the period the English speaking world calls "The Regency". This is the "Regency Waltz" - a dance form that is very little understood in the "vintage dance" community. It had some fundamental differences from the Victorian and modern waltz forms, which are laid out in considerable detail in this brief work. A Description of the correct method of waltzing the truly fashionable species of dancing: that from the pleasing Beauty of it Movements has attained an ascendancy over every other Department of that Polite Branch of Education. 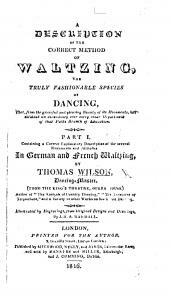 Part 1: Containing a correct explanatory Description of the several Movements and Attitudes in German and French Waltzing by Thomas Wilson Dancing Master. From the King's Theatre Opera House. The PDF is complete, with the exception of the extensive list of subscribers, which I thought best to omit to save bandwidth, and if you print it out, paper.